“Beis Rabbeinu sh’b’Bavel” — A must! This incredible kuntres (edited by the Rebbe and distributed for 20 Cheshvan, 5752, the birthday of the Rebbe Rashab), is a systematic explanation of how in every generation the synagogue and study hall of the Nosi Hador, the spiritual head of the generation, is the replacement for the Holy Temple during the exile. It is the place where the Shechina is revealed in the strongest measure. In our times, this is 770 Eastern Parkway, the synagogue and study hall of “my father-in-law the Rebbe, the leader of the generation”. Additionally, the Rebbe explains how the Nosi Hador is the Moshiach of the generation. Click below to access a PDF file containing a professionally produced, accurate translation (by R’ Alexander Zushe Kohn שיחיה) with accompanying footnotes. Not to be missed! The Rebbe mentions, in the printed sicha of Vayera 5752 (last week), a midrash* which states that the month of Marcheshvan (when the construction of the first Beis Hamikdash was completed, but it wasn’t opened until the following Tishrei) “lost out” and in the time to come the Holy One, blessed be He, will pay her back with the inauguration (chanukas) of the 3rd Beis Hamikdash which will take place in the month of Marcheshvan. What significance does this have to the events of Marcheshvan 5752, when the sicha was spoken and printed? Several days after the sicha was spoken, and a day or two before the sicha appeared, in that very month of Marcheshvan, there was a revelation of the Beis Hamikdash. This revelation was (and is) contained in a small booklet, the Kuntres Beis Rabbeinu sh’b’Bavel, edited by the Rebbe and published in honor of 20 Marcheshvan (birthday of the Rebbe Rashab). In this Kuntres, the Rebbe explains the words of the Gemara that the following the destruction of the Beis Hamikdash, the revelation of the Shechina which was revealed in the Beis Hamikdash “traveled” from Yerushalayim together with the Jews as they went into golus. Where did it settle? In the study hall and synagogue of the leader of the respective generations. In our generation, explains the Rebbe, this is 770 Eastern Parkway, the study hall and synagogue of the Rebbe, the leader of the generation (of course, the Rebbe makes the reference to his father-in-law, the Previous Rebbe). Now we can appreciate the unique greatness of Beis Rabbeinu: As the main Small Temple of the final exile, Beis Rabbeinu is the very place of the future Beis Hamikdash, and moreover, the place where the future Beis Hamikdash will first be revealed, and the place from which it will return to Yerushalayim. The implications are startling: this Kuntres reveals to us, based on the Rebbe’s explanation of a posuk in Yechezkiel and a sugya in the gemora, that the Beis Hamikdash is located at 770 Eastern Parkway, and this is the “very place itself”** (מקום המקדש גופיה דלעתיד) where the 3rd Beis Hamikdash will descend from Heaven, and from this place it will travel to Yerushalayim! In other words, the Beis Hamikdash (as well as the place of the 3rd Beis Hamikdash) has been revealed in the realm of the intellect! In the month of Marcheshvan. 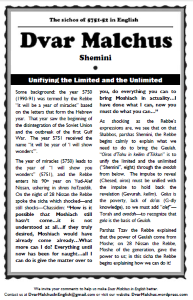 And as the Rebbe explains, in last week’s sicha, in order to experience the revelation we have to desire it and then labor to make ourselves a fitting vessel (like Avraham Avinu did and thus he merited that Hashem was revealed to him), otherwise it will remain in the intellectual realm, unseen by physical eyes. Please, do not suffice with these few words in this meager essay, but take the opportunity to read through (and even better–learn properly and in depth) the Kuntres Beis Rabbeinu sh’b’Bavel (available for viewing and printing here). After all, the Rebbe emphasizes numerous times that it is through learning the inyonim of Moshiach and Geulah that we speed up the actual true and complete Geulah. As the Rebbe says–all elements of the Geulah are here, we simply need to agree and desire and open our eyes. Learning these inyonim is the “fast way” to open our eyes. * Yalkut Shimoni, Melachim I, remez 184. Footnote #108 in the sicha. ** See the maamor “Gadol Habayis Hazeh”, section IV and forward, for the significance of the place of the Beis Hamikdash as opposed to the structure itself.